Those of us who are familiar with Kristen Painter House of Comarré series knew to expect great things from her new urban fantasy adventure. However, I don’t think any of us expected this level of improvement over her previous work. As good as House of Comarre was, the Crescent City series is urban fantasy at its best, a shining star that promises to be even brighter in future installments. The two series are even vaguely linked, but rest assured, once can be fully enjoyed and understood without the other. House of the Rising Sun is mostly told from two points of view: those of Augustine Rabelais and Harlow Goodwin. Our connection with the two protagonists, Augustine especially, is instant and very strong. The prologue reveals a single scene from Augistine’s dreadful childhood which immediately causes us to develop protective feelings toward him, feelings that only strengthen once we discover what kind of man he’s become. The amount of strength and resolve he must have needed to outgrow such horrendous circumstances and become a charming, upstanding man is admiration worthy and quite staggering. Harlow is a bit more difficult to understand and like, at least at first. While Augustine learned kindness from those who were kind to him – namely his benefactor Olivia Goodwin – Harlow had no such opportunities. The Harlow we meet is closed and self-centered, focused on her own needs and careless of other people’s feelings. She’s a bit spoiled and so afraid of everything, and she constantly hides behind her computer screen, preferring a life online to actual human contact. But as Harlow starts caring about those around her, our own affection for her grows stronger, and by the time we finish the story, she is just as dear to us as Augustine. Augustine and Harlow are complete opposites in everything, but their attraction is undeniable. This being a real urban fantasy novel and not a paranormal romance disguised as one, the focus is primarily on the war between the fae and vampires, a war in which our Augustine, as fae Guardian of New Orleans, has a lead position. The romance, however, is a constant subtle presence in the background, and only Harlow’s reluctance to trust keeps things from progressing too fast. As it is, the slow burn of their feelings is a true delight and we’re left with so much to look forward to in future installments. 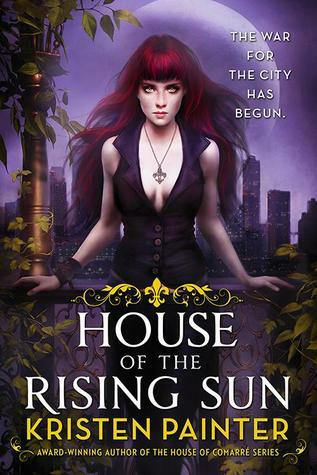 House of the Risings Sun is without question the best new urban fantasy I’ve come across in a very long time. I cannot recommend it highly enough. Wow, wonderful review. that's great you are loving this one so much and that you feel it's even better than the author's previous series. I like that the two are connected, but can still be read alone. Wow, I have never heard of Kristen Painter before but now I'm slowly considering how poor my reading choices are. House of the Rising Sun sounds incredible and I kind of love how the title nods to that wonderful song by The Animals. I'd definitely check this out as soon as possible. Thanks for putting this on my radar. Fantastic review, Maja! I loved Augustine. He is a great character. I can't wait for the next book. It's nice to know it's possible to read this series without the other one. I confess I'm quite curious about the book even if I saw different reviews. I have the first one in the House of Comarré series so I should try it too. Thanks for the review! "The prologue reveals a single scene from Augistine’s dreadful childhood which immediately causes us to develop protective feelings toward him"
I haven't read anything by this author before or even heard of this series or the previous one, but your review and the fact that is the first of a new series, I'm quite intrigued enough to add it to the wish list right now! Quite happy to hear the romance doesn't take over the story either and that's the slow burn kind! Oooh, this one sounds really good! Great review! I was waffling about picking up the House of Comarré series but I think I will start this one instead since it got such high appraisal from you. I'm adding it to my tbr pile. Thanks for the recommendation! OMG! I enjoyed her last series so I NEED this one. If you say this is good UF I'm totally on board and so can't wait to try it. MUST and WILL add this one to my wishlist. Ok if this is the best UF you have read in awhile, it is time that I read it. I will add it to the list, or maybe we can do it for the UF Challenge? I am always on the look out for new urban-fantasy books to read and I know I can count on you to recommend some good ones, Maja! I do not read enough urban-fantasy is I am honest, so I will be certainly adding this to my wishlist. I had never actually heard of the author before, but the description that she has improved by a lot certainly piques my interest. The characters sound fantastic, and I definitely feel excited about getting my hands on this.